Dealing with a cloudy atmosphere is common place all around Canada and although it is primarily the weather, your windows can be cloudy too. When your windows and doors aren’t giving you the full view that you deserve, let our Kitchener window cleaning achieve that for you. When you are looking to make the most out of your picturesque Kitchener views, let our Gorillas help. Glass as a material, can add a lot to your home or business. Natural light, warmth, and ambience are all side effects of having clean windows. The windows around your space are a vital part of daily operations but keeping them clean can often be a daunting task. Instead of being as solid as they might feel, windows are porous. This means that any sitting dust, dirt or debris can seep into surfaces over time. As foreign materials seep into your windows, they are degrading them from the inside out. This can drastically reduce the life expectancy of your windows, leading to breakage and replacement. Instead of dealing with the hassle of emergency window replacements, choose routine maintenance instead. 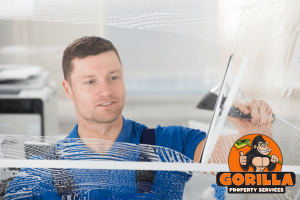 By taking advantage of regular window cleaning services, you can prolong the lifespan of your windows while keeping a clear picture for yourself. 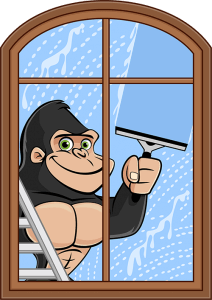 By moving away from traditional methods such as everyday glass cleaners, our Gorillas have been able to perfect their Kitchener window cleaning skills. Opting for rubber tools such as squeegees combined with eco-friendly cleaners, our Gorillas can operate safely and effectively around your home or business. Do you have higher windows? That is not a problem! Water-fed poles and a mobile water device help our Gorillas reach windows up to four storeys high.